Brighton & Hove City Mortuary provides postmortem and storage facilities for deaths that are reported to the Coroner. These deaths are often sudden and unexpected, natural or unnatural. The City Mortuary also provides facilities for forensic postmortems and also high-risk postmortems. The City Mortuary staff work closely with the Coroner’s office for Brighton & Hove, East Sussex and West Sussex County Councils, Sussex Police and the NHS. Biodegradable coffins, suitable for burial or cremation, are available for collection if required from the City Mortuary. There is a Chapel of Rest within the public area of the mortuary, allowing family and friends to view the deceased. Viewings are strictly by prior appointment only and one hour is allocated per appointment. In some instances, it may not be possible to view the deceased until after the postmortem examination has been completed. Parking is available along with a waiting room and toilet facilities.The mortuary is fully accessible for the disabled. 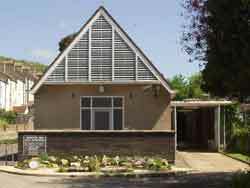 The mortuary is located in the Extra-Mural Cemetery, Lewes Road, BN2 3QB. It is staffed between 7am to 3pm Monday to Thursday and 7am to midday on Friday. The entrance gates (MS Word 488KB) to the Extra-Mural Cemetery are located between Newmarket Road and Gladstone Place​. For further information, contact the City Mortuary staff.